Released on: Frontiers Records. Release date: Available now. Yes, folks, another album that’s released already and has been out for about a month now. Too much new stuff hitting me up and being a one man show – People have offered to help with reviews, but sadly not come through when they realize how much it takes, but at least some have with gig reviews. Thank you those folks. – it’s tough to stay on top of all this. Anyway, here we go with another great new release from an extremely huge talent, who has simply proved himself time and time again. This really is a GREAT album, I truly love it! Should I leave it there ….? OK, review done! Ha ha! Ah, but I can’t, I really have to tell you more! Jimi Jamison seriously, what a talent! Even when you listen back to his pre-Survivor days, with both Cobra and Target, the material was always good strong stuff with the man’s vocals shining through again and again. When Survivor released the first album to feature Jimi Jamison, 84’s ‘Vital Signs’ the chemistry was simply undeniable! For me, the follow up ‘When Seconds Count,’ although a little more thought out musically, I felt it was easily just as good and then they put out the rockin’ ‘Too Hot To Sleep’ in 1988 which was the last studio release for some time. The band toured from time to time, although they seemed to be under the radar for the most part with little or no promotional push from anywhere, finally ‘Reach’ was released in 2006 but Jamison departed almost immediately after this. The band continued with the excellent Robin McAuley (McAuley Schenker, Grand Prix, Far Corporation), but only in a touring capacity, no more studio releases. Jimi got into his stride with his solo career, although during the on / off Survivor years, he did put out under the title of Jimi Jamison’s Survivor, the classy ‘Empires’ in 1999. Jimi’s solo work to date has included ‘When Love Comes Down,’ in 1991, in 2008 the much praised ‘Crossroads Moment,’ then the low key ‘Extra Moments’ alongside fellow former Survivor talent Jim Peterik (Ides of March, Pride of Lions) in 2010. He then teamed up with former Toto vocalist Bobby Kimball for the appropriately titled ‘Kimball / Jamison’ in 2011, which was a strong release. Here’s the thing though, not only is Jimi singing great, but he’s teamed up with a class act in Erik Martensson (Eclipse, W.E.T. ), who is another greatly talented all-rounder, who’s co-written and produced so much magic right here. Great band behind these guys too, this is a seriously class album, I’d go so far as to say it’s the best Survivor album they NEVER released! Yes, I think it’s that strong! ‘Everybody’s Got A Broken Heart’ starts with an almost typical true Survivor style gentle keyboard intro and then rocks out and gets into a great groove! Great rocking guitar, sweet keys, killer harmonies and melodies in the best Survivor style ever! Would love to see Jimi live again, shame his solo shows are usually limited to Europe ony. ‘The Great Unknown’ keeps it going with a more gritty vocal from Jimi from the start and then the song just grows and grows and the Hammond organ sound is great too, but there’s just so much more to this. The chug along guitar through the verses and then the pre-chorus into the then killer chorus is simply wonderful! Great lead work from Erik too, just all round AOR bliss! 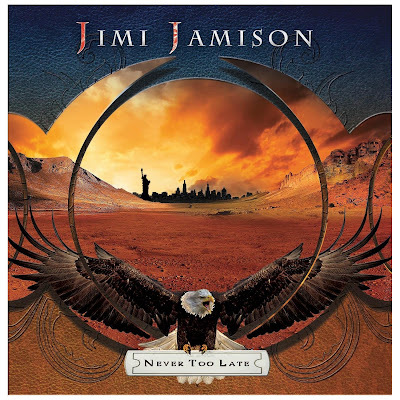 The title track ‘Never Too Late’ is next which has that gentle keyboard intro accompanying Jimi’s vocal and again, this is one of those great tracks that just builds and builds and yes, the chorus will just floor you. Love it! ‘I Can’t Turn Back’ starts atmospherically and then starts to build just about a minute in and it’s another huge track that layers up and down, in classic 80’s style so if you miss that classic, nay, CLASSIC Survivor sound, then this album is for you! Oh boy, next track ‘Street Survivor’ brings to mind ‘American Heartbeat’ from the intro and then wham! It’s a great AOR rocker of the finest calibre, people BUY THIS ALBUM! The track just oozes greatness, it really does. It’s power ballad time in ‘The Air That I Breathe’ and huge kudos for everyone’s input to this and the whole album. It’s just one gem after another, it really is and I can’t say that enough. ‘Not Tonight’ is a great pop rocker that starts with an intro like something Starship might use and then it gets into an almost Bryan Adams like groove, before the pre-chorus sounds a little like Def Leppard! Erik Martensson becomes Mutt Lange! Ha ha! With ‘Calling The Game,’ I’m very much reminded once again of classic era Survivor, brilliant! Nice up tempo smooth AOR rocker, classy yet again! Erik Martensson really has done his Survivor homework on song structures, ‘Bullet In The Gun’ starts with gentle piano arpeggios and then in kick the power chords and the whole band is onboard! This really is a magical trip down memory lane, in terms of song styling, but there’s without doubt modernisms in terms of keeping the overall sound up with the likes of Eclipse, Work Of Art, etc type material. Love it! The album is closed by the excellent rocker ‘Walk On (Wildest Dreams),’ which is simply melodic hard rock of the finest calibre. I mean it, I love this album, no complaints and it’s an album I keep going back to listen to again and again, to be honest just as I used to do with ‘Vital Signs’ and ‘When Seconds Count,’ but you know what this is just so right up to date, it’s magical it really is. An absolute winner by me! Now Jimi, what chance of a Detroit date, eh? !